In the same week the cannabis became legal in Canada, the federal government announced the prohibition of asbestos and asbestos-containing products, according to a recent study published at DailyCBD.com. The government action is considered the final step in the prohibition of asbestos and asbestos-containing products in Canada. These new regulations are part of the government-wide strategy announced in 2016 to protect Canadians from exposure to asbestos. The new regulations prohibit the import, sale, and use of asbestos as well as the manufacture, import, sale, and use of asbestos-containing products, with a limited number of exclusions. In addition, exports of asbestos and asbestos-containing products are now prohibited, with a limited number of exceptions, and the existing Export of Substances on the Export Control List Regulations and schedule 3 of the Canadian Environmental Protection Act, 1999 were amended to reflect that. The new regulations and related amendments will come into force on December 30, 2018. They will protect the health of Canadians by preventing new asbestos and asbestos-containing products from entering the Canadian market. “This is the final step to ban asbestos in Canada. We have followed through on our promise to deliver new, tougher rules to stop the import, use, sale, and export of asbestos in Canada. These measures will protect our communities and the health and safety of all Canadians,” stated Catherine McKenna in a news release. Asbestos was declared a human carcinogen by the World Health Organization’s International Agency for Research on Cancer, in 1987. At the height of its use, asbestos was found in more than 3,000 applications worldwide. The regulations do not apply to residues left from mining asbestos. However, these asbestos-mining residues cannot be sold for use in construction or landscaping without provincial authorization, and they cannot be used to make a product that contains asbestos. The mining of asbestos in Canada ceased in 2011. Risks related to asbestos-containing products that are already in use or installed—such as in existing buildings, equipment, and vehicles—will continue to be managed by existing federal, provincial, and municipal rules and regulations. There are no significant health risks if asbestos fibres are enclosed or tightly bound, in good condition, and left undisturbed. The use, sale, and export of any asbestos-containing products that exist in inventories but that have not yet been installed are prohibited under the new regulations and related amendments. The current Asbestos Products Regulations under the Canada Consumer Product Safety Act will be repealed as these new regulations are more comprehensive. Airthings, a company specializing in digital radon detectors, recently launched RadonMap.com, a live global Radon map. The map pulls constantly-updating Radon level data from Airthings’ devices all over North America, Europe ,and beyond to provide current localized analysis and advice – ideal for anyone looking to for the risks associated with radon exposure. Radon is a radioactive gas that occurs naturally when the uranium in soil and rock breaks down. It is invisible, odourless and tasteless. When radon is released from the ground into the outdoor air, it is diluted and is not a concern. However, in enclosed spaces, like homes and offices, it can sometimes accumulate to high levels, which can be a risk to the health of the occupants of the building. Radon gas breaks down or decays to form radioactive elements that can be inhaled into the lungs. In the lungs, decay continues, creating radioactive particles that release small bursts of energy. This energy is absorbed by nearby lung tissue, damaging the lung cells. When cells are damaged, they have the potential to result in cancer when they reproduce. Exposure to high levels of radon in indoor air results in an increased risk of developing lung cancer. 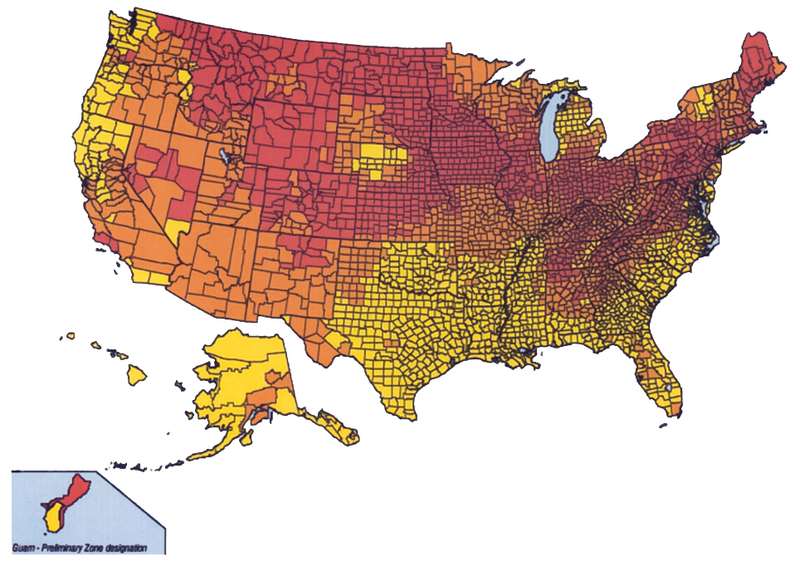 The risk of cancer depends on the level of radon and how long a person is exposed to those levels. Exposure to radon and tobacco use together can significantly increase your risk of lung cancer. For example, if you are a lifelong smoker your risk of getting lung cancer is 1 in 10. If you add long term exposure to a high level of radon, your risk becomes 1 in 3. On the other hand, if you are a non-smoker, your lifetime lung cancer risk at the same high radon level is 1 in 20. RadonMap.com aggregates radon level data from Airthings’ devices dispersed all over the world to provide accurate, local radon readings for users seeking current and reliable insight into the dangerous indoor gas and how much exposure they are subjected to daily. Previously, gaining an understanding of localized Radon readings was only possible through professionally-administered tests or government data, offering a one-time snapshot rather than a constantly-evolving picture. With the introduction of the Airthings RadonMap.com, radon levels and fluctuations can be tracked accurately through a community of user-generated data. RadonMap.com instantly becomes a very reliable and up-to-date information source available for alerting the public about the presence of Radon in their environments and enabling them to take corrective action, if necessary, before a situation becomes critical. Airthings is a Norwegian tech company that develops and manufactures both professional and consumer facing technology. These products include monitors for radon and other dangerous indoor air pollutants. The company was founded in 2008. The Eleventh Circuit Court of Appeals recently had the opportunity to remind employers not to ignore training employees on safety. Martin Mechanical Contractors, Inc. v. Secretary, U.S. Department of Labor, No. 17-12643 (March 27, 2018). 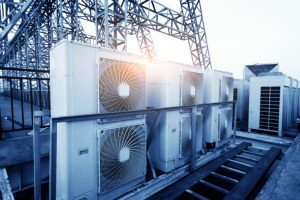 In late 2015, a heating, ventilation, and air conditioning (HVAC) contractor was installing an HVAC system on the flat roof of a warehouse in Georgia. The installation was to take place adjacent to several unguarded skylights covered only with plastic sheeting. While the onsite foreman had fall protection equipment in his truck, the employees did not wear any fall protection equipment while on the roof. These circumstances ended in tragically: one of the workers fell through a skylight and died as a result of his injuries. The Occupational Safety and Health Administration (OSHA) cited the employer for a willful violation of 29 C.F.R. § 1926.501(b)(4)(i) for failing to protect its employees from falls. The administrative law judge concluded the supervisor’s actions supported a willful classification in that he demonstrated a “reckless disregard for the safety of his crew.” The employer appealed. To support a willful classification, OSHA must show either (1) the employer knew of the standard and consciously disregarded it or (2) it exhibited such reckless disregard for the employees’ safety that the employer would not have cared that the conduct violated the standard. Evidently, the supervisor claimed ignorance of the law, and the court analyzed whether the willful classification could be supported under the second standard. The court of appeals was unimpressed by the employer’s arguments. The court noted the supervisor was well aware of the danger posed by the unguarded skylights in that he warned his employees to be careful around them. The supervisor also testified it was his practice not to use fall protection equipment on flat roofs. The supervisor neither instructed anyone to wear fall protection equipment nor provided his employees with the fall protection equipment he had in his truck. Thus, the Court concluded, while the supervisor did not know of the standard’s requirements, he exhibited such reckless disregard for employee safety that he would not have cared that the conduct violated the standard. This is where all employers may want to take heed. The court went on to observe that the supervisor’s “unfamiliarity serves, if anything, only to underscore the inadequacy of [the employer’s] training program. To hold that such inadequacy—and the resulting unfamiliarity—precludes classification of a violation as willful would perversely allow [the employer] to use its ineffective training as a defense against OSHA’s most serious charge.” The court upheld the willful classification. Needless to say, a willful citation can have far-reaching ramifications for an employer—from tort liability and criminal penalties for the injury or death to inability to secure future work. While training may seem trivial and time consuming, doing it just might prevent a willful citation and possibly save a life. This article was originally published on the Ogletree Deakins website. On March 28, 2018, the Office of the Inspector General (OIG) of the U.S. Environmental Protection Agency (EPA) issued a Project Notification indicating its plans to begin preliminary research to evaluate the EPA’s implementation and enforcement of the Lead-Based Paint Renovation, Repair and Painting Rule (RRP Rule). The RRP Rule, which is part of the federal Toxic Substances Control Act, is intended to ensure that owners and occupants of pre-1978 “target housing” and “child-occupied facilities” receive information on lead-based paint hazards before renovations begin, that individuals performing such renovations are properly trained and certified, and that renovators and workers follow specific lead-safe work practices during renovations to reduce the potential for exposure to lead. Although use of lead-based paint in dwellings was prohibited after 1978, EPA estimates it is still present in approximately 30 million homes across the United States. The RRP Rule is intended to protect children and others vulnerable to lead exposure due to the health effects associated with lead poisoning. Enforcement of the RRP Rule, along with the other lead-based paint rules, has been a priority of EPA. For fiscal year ending 2017, according to EPA’s Oct. 27, 2017 press release from October 2016 through September 2017, EPA finalized 121 civil settlements for alleged violations of one or more of the three lead-based paint rules–the RRP Rule; the Lead Disclosure Rule; and the Lead-based Paint Activities Rule for abatements–and filed three complaints for ongoing actions. EPA and the U.S. Department of Justice also prosecuted one criminal case involving violations of lead paint laws and finalized two Clean Air Act settlements that included lead paint abatement projects in local communities. The OIG Project Notification indicates that the “objective for this project is to determine whether EPA has an effective strategy to implement and enforce the lead-based paint RRP.” Only time will tell what is meant by that. Dianne R. Phillips is an attorney in Holland & Knight’s Boston office who concentrates her practice in litigation, regulatory, energy and environmental law. As former assistant general counsel for Suez LNG North America LLC (now known as Engie North America) and its wholly owned subsidiary, Distrigas of Massachusetts LLC, Ms. Phillips was involved in all aspects of regulatory compliance for the nation’s oldest, continuously operating liquefied natural gas (LNG) import terminal located in Everett, Mass., including safety and security. Her LNG experience includes advising clients with respect to specialized regulatory compliance under 49 C.F.R. Part 193 and NFPA 59A. Imagine for a moment it’s Monday morning. You’ve just arrived to work and you’re enjoying your first cup of coffee. Unexpectedly, you receive a call from the receptionist. The U.S. Occupation Safety and Health Administration (U.S. OSHA) has just arrived and they’d like to meet you to discuss a safety complaint they’ve received from an employee. Your day just got a little bit more complicated! So, what should you expect during the OSHA visit? What questions should you ask and perhaps more important, what should you avoid? What will OSHA want to see during their visit? Will they ask you for paperwork? Do you have that paperwork? 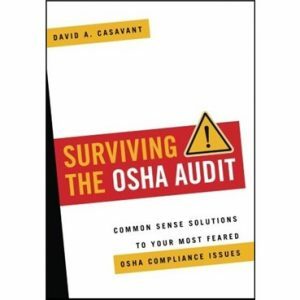 Within this book, respected OSHA consultant, David A. Casavant takes you behind the curtain and reveals exactly what happens during an OSHA inspection, rules for behavior during the audit and perhaps more importantly, what you can do now to comply with the often-complicated U.S. OSHA regulations. This essential guide simplifies complex regulatory law, provides commonsense strategies for compliance and should be included in every safety professional, risk manager, or attorney’s toolbox. The author of the book, David A. Casavant is the Executive Director of the Sustainable Workplace Alliance, a 501(c)(3) not‐for‐profit organization dedicated to Health & Safety in the workplace. He is an authorized OSHA 500 & 501 trainer and in 2007, 2008 and 2010 his organization was awarded the prestigious Susan Harwood training grant from the U.S. OSHA. He has been a featured speaker at World WorkPlace, American Management Association, Rockhurst University, NeoCon, SkillTV, Total Facility Management Forum and the NFM&T conference. Additionally, Mr. Casavant has written hundreds of business related articles. His articles can be found in a number of trade publications including the Facility Management Journal, Buildings, PlantServices, SkillTV and Building Operating Management. You can order the book through the American Society of Safety Engineers website.